Imagine, if you had to walk around every day barefoot with rarely washing your feet except when you take your monthly bath? 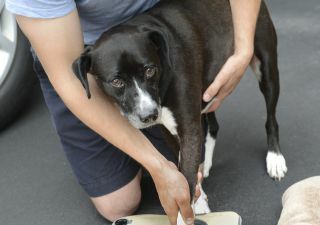 Many pet owners struggle with watching their dog lick their paws or worse yet chew those paws incessantly. In many cases, this is a direct result of having contaminated paws. 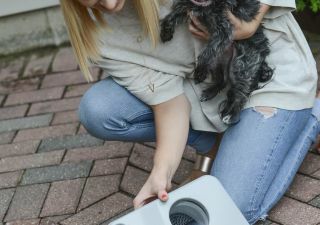 Unfortunately, not many pet owners realize the amount of dirt, germs and allergens that can build up over time on those paws not to mention many of these tiny little warriors ultimately end up in your home. Many professionals say that regular footbaths are critical for your pet and one of the best ways to remove the dirt, germs & allergens is to simply wash/soak those paws in CLEAN water. 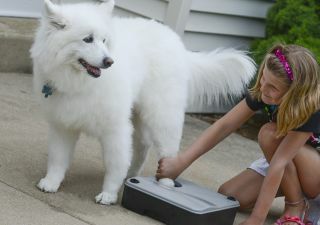 That’s the exact reason why we designed this all new patented paw washer because we saw a need in the market for a paw cleaning device that could literally “soap and soak” every single paw with fresh clean water without having to constantly go back and forth to the sink for clean water. You will NEVER have to reuse dirty water again to clean those paws. Why is the Paw Boss Better? There are no moving parts to wear out. You simply tilt the Paw Boss in different directions to fill and empty the paw wash cup. So simple even kids can use it. 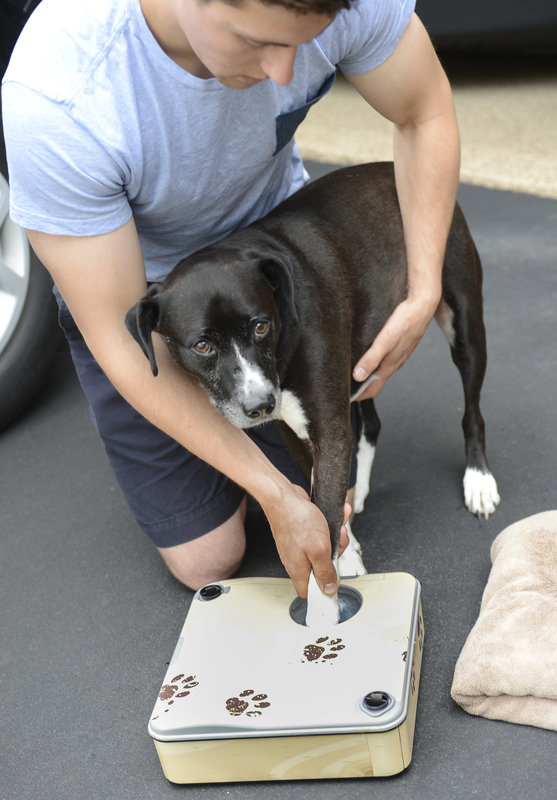 Weighing only 7lbs filled, you can place or take the Paw Boss anywhere in your home or even take it with you in your car to the dog park. It’s like having a mobile paw washing sink with all the plumbing built into it. With the built-in reservoirs, you constantly keep clean and dirty water separate always ensuring fresh clean soapy water for every paw. Holding ~72oz of clean water, you can wash up to 8 paws on just one filling. If your pup struggles with incessant paw licking or paw chewing, this product will make a significant difference in the quality of life for your best friend. 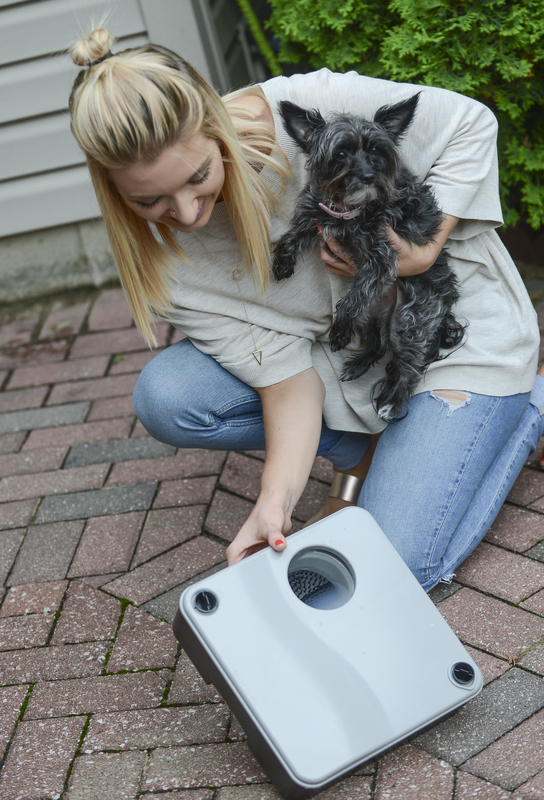 The key feature of the Paw Boss is its ability to use fresh clean soapy water for every paw (without going back and forth to the sink) which professionals say is one of the most effective ways to remove dirt, germs and allergens from those paws. Proven by an outside lab, the Paw Boss removed *99.5% of the bacteria and *99.9% of the fungi from those paws (*with using anti-microbial soap in the clean water reservoir). And just think how much cleaner and healthier your home will be if you are removing all that dirt, germs and allergens from those paws! It’s important that your dog isn’t scared to have their paws washed so we designed this product to be non-invasive and gentle on those paws. You simply insert your dog’s paws in the paw 3½” diameter wash cup and gently move that paw over the very soft removable finger-like pad that sits on the bottom of the cup. 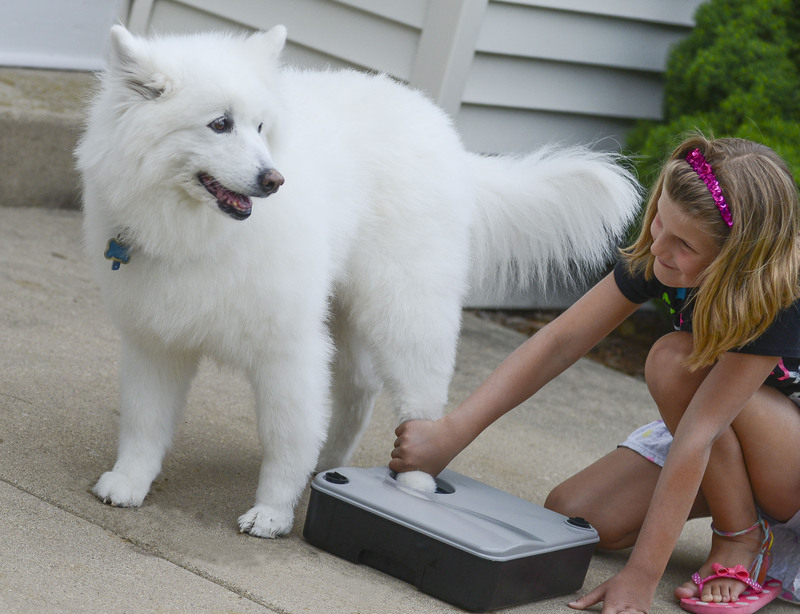 Fill the Paw Boss with warm water and make that paw washing experience even more enjoyable for your pup! Designed with heavy duty .125” ABS plastic, the product is built to last. Made in the USA and manufactured in Central Illinois. The Paw Boss was designed to be aesthetically very pleasing but if you decide you want it to blend in better with your décor or just want to have a little fun with it, consider adding one of our high quality vinyl skins to the Paw Boss. We have partnered with one of the largest vinyl skin manufacturers to provide you numerous patterns from granite, steel, hardwood, to stainless or even a fun beach pattern. They are removable and can be changed out whenever you desire a new look. With all the natural recipes out there for paw soothing, disinfecting & deodorizers, you can add all kinds of fun ingredients into the clean water reservoir to make the “stink pads (paws)” look, smell and feel great. If you have any questions about the Paw Boss, please fill out the form below.